Be sure to check out our Masters in Business interview this weekend with David Rosenberg, chief economist at Gluskin Sheff. 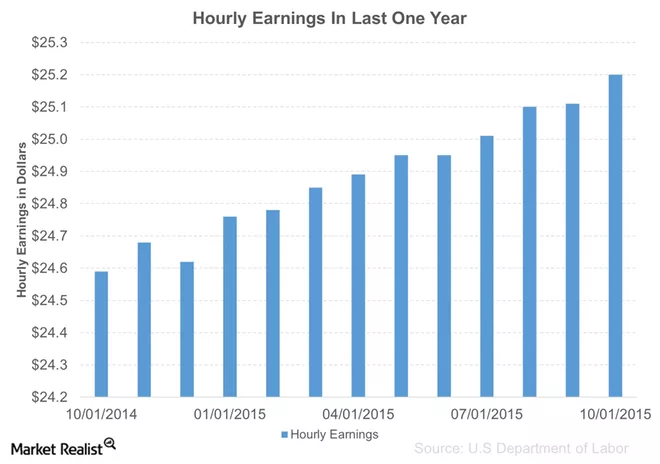 The graph makes the year/year increase in the average hourly wage appear appear quite large. The increase was $0.61, which was 2.48%. The core CPI (less food & energy) increased 1.9% through September (October data will be released in the coming week) with real wages increasing ~0.6%. Enjoyed the ETF story is in which Kraus complained about 30% discount in large fund. Spotting this tremendous inefficiency, he must have bought heavily at that time, right? If not, why not? Atlantic article on Isis is best explanation yet that I’ve read. He got one bit wrong though assuming Isis is behind Paris attacks. He wrote exporting attacks isn’t part of their plan. Optimally we’ll join forces with EU, Turkey, Iran, Russia and blow the smithereens out of them. They may morph but much diminished as they are more hierarchical than AQ. WASHINGTON — Smoking, the leading cause of preventable death in the United States, continued to decline last year, federal health authorities reported Thursday, with the share of American adults who smoke dropping to 16.8 percent, down from 17.8 percent in 2013. Smoking has been one of the brightest public health successes of recent history. Nearly half of all Americans smoked in the 1960s, but a broad push against the habit, starting with the surgeon general’s warning in 1964, helped bring rates down. The rate has dropped by about a fifth since 2005, when it was 21 percent. But the national numbers mask deep trouble spots within the American population. About 43 percent of less educated Americans smoked in 2014, compared with just 5 percent of those with a graduate degree. About a third of Americans insured by Medicaid, the health insurance program for the poor, smoked, compared with 13 percent of Americans with private insurance. Caffeinated peanut butter? Say whatttttttttt??? It started as a conversation about the perfect sandwich to combat a hangover. Peanut butter and jelly on thick slices of banana bread, the three friends decided. With crispy bacon layered in for crunch. From that lighthearted beginning, Pettazzoni and partners Keith Barnofski and Andrew Brach created Steem caffeinated peanut butter, the latest entry in a growing corner of the food world that has some federal regulators feeling jumpy. There are caffeinated potato chips, sunflower seeds, gummy bears and beef jerky. You can pour caffeinated maple syrup onto your caffeinated waffles. You can enhance your water with caffeinated flavoring. Wrigley even launched a caffeinated gum a couple years ago before pulling it from the market because of concerns from federal regulators.